I acknowledge the inconsistency of an austerity plan side by side with a re-jiggered luxo-barge but I admit to being a bit fascinated with the idea of the Phaeton. The last time we went through the “we’re bringing the Phaeton back” phase was in 2009, right after the end of the great recession. 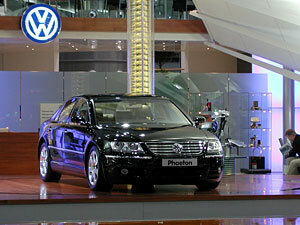 At the time I wrote a post (“Has the VW Phaeton’s time come?“) and offered up the possibility that the Phaeton could be the luxury car for a new post recession sensibility. I still think that possibility still exists, but the surging millennial generation adds a different twist to the idea. After all, so many millennials grew up driving Volkswagens and we know for a fact that VW holds a special emotional place in American culture. In five years millennials as a generation will be driving luxury segment sales. I think about a new generation of luxury car buyers, who are emotionally attached to the VW brand, who want to naturally separate themselves a bit from their parents and their parents’ luxury car choices (Mercedes-Benz, BMW, Lexus) and I say to myself that’s an opportunity! 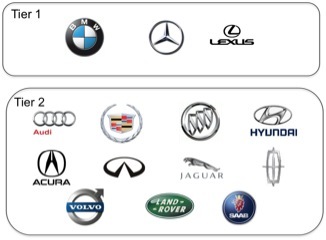 Infiniti: From “rocks and trees” to “brush-strokes,” can it become a Tier I luxury brand? Infiniti from the very beginning has had a difficult time establishing a brand identity and finding a way to execute it in communications. Introduced in 1989, Infiniti was Nissan’s response to the introductions of the other Japanese luxury marques, Acura and Lexus. The original Q45 was a sporty performance alternative to the Lexus. Unfortunately, Infiniti got off to a rough start when it introduced the car and brand with the infamous “rocks and trees” campaign created by its agency Hill, Holliday, Connors, Cosmopulos. “Lexus’ plans: Not just big-bucks sedans”—Do you know where your BOHICA t-shirt is? Here it comes again, another automotive luxury brand seeking to have “wider appeal without tarnishing the image” (Automotive News 1/11/10). Lexus is concerned that their customers are too old and they are not appealing to the next generation of luxury car buyers. A reasonable concern. Lexus appears to be addressing this concern in the usual way that automobile manufacturers do. First, you add product to your line-up that is designed to meet the requirements or interests of the new target group (after all, they’re very different from the current customers), then you lower the cost of entry into your franchise (they don’t have as much money as the current customers) and finally use marketing to convince the younger target that your brand is cool (at least cooler than they think it is). Unfortunately, this approach always has the same result, you may succeed in selling a few more cars to the new target group but you leave your current customers confused and your brand weakened. The Automotive News article even quotes Jessica Caldwell from Edmunds.com who says: “Lexus was really strong, but they have lost their footing….BMW is the ‘Ultimate Driving Machine.’ We’re not really sure what Lexus is.” I agree with her. The overheated luxury segment experienced so much growth in the ’90s and early ’00s, that many of the luxury marques that were fortunate enough to have clear positionings in the beginning were weaker and less distinct at the end of the run-up.